This revolutionary, hands-free Touch n Brush toothpaste dispenser uses vacuum force technology to dispense the perfect amount of toothpaste every time-with just one touch. No mess, no waste! 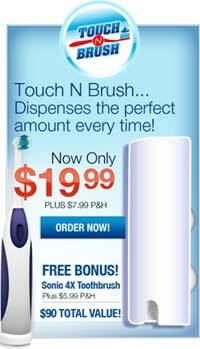 Plus, buy the dispenser, get the toothbrush FREE. Plastic. 101/2 in. H.
No More Kids leaving behind a mess in the morning! We bought this when we painted our restroom. This is very easy to install (not really install, as its just sticking it to wall). We use it everyday and never had any issues using it. We bought three of these.